The twins-2 study explores genetic differences among identical twins, of whom at least one twin has a diagnosis of ASD, and their parents. 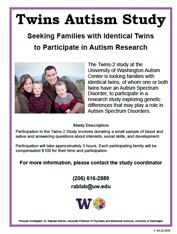 We are looking for identical twin pairs ages 4 and up in which at least one twin has Autism Spectrum Disorder (ASD). Participation includes delivery of saliva and blood samples, and answering questionnaires. In person visits to our lab are not required for participation!